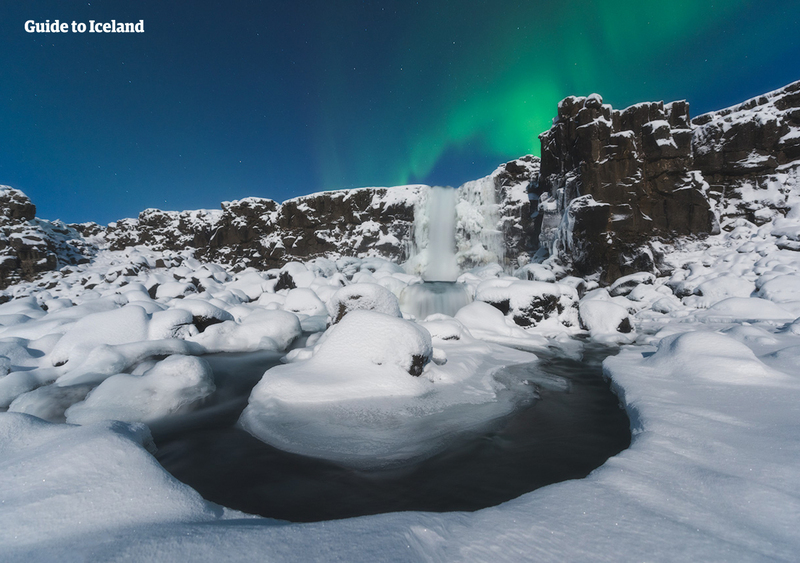 Get the ultimate Icelandic experience and do so without breaking the bank with this three-day winter tour. See geysers erupt on the Golden Circle sightseeing route, the cascading waterfalls and black sand beaches of the South Coast, and explore glaciers on a glacier hike and a visit to a natural ice cave. Anyone looking to see the best of the Icelandic nature in winter should book this tour now. 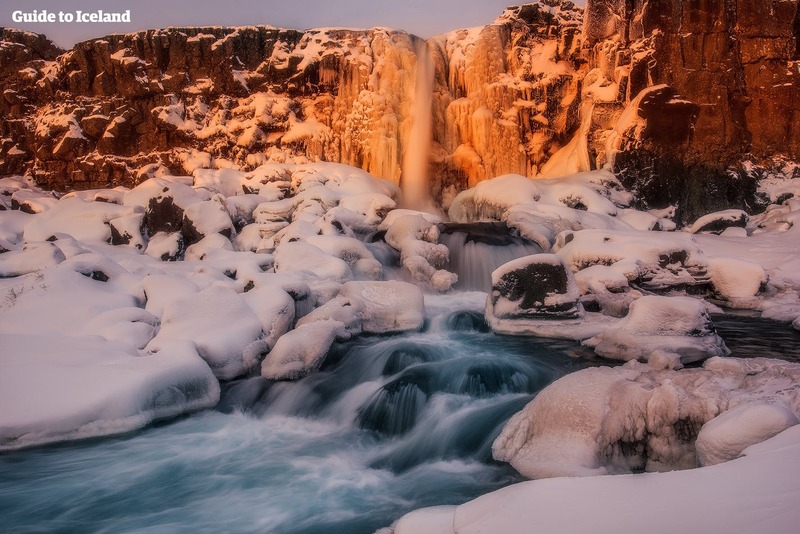 This low-cost tour is perfect for those who wish to immerse themselves in the beautiful Icelandic nature, as you’ll visit some of the country’s most spectacular sights, including Þingvellir National Park, Reynisfjara black sand beach and Jökulsárlón glacier lagoon. If that is not enough, you will also step inside an ice cave, hike up a glacier, and hunt for the Northern Lights. This tour will allow you to travel without a worry as transportation and accommodation will be sorted out prior to your arrival in the country. You will comfortably stay at the best available accommodation, all the while avoiding unnecessary pulls on the purse string. So don’t wait! 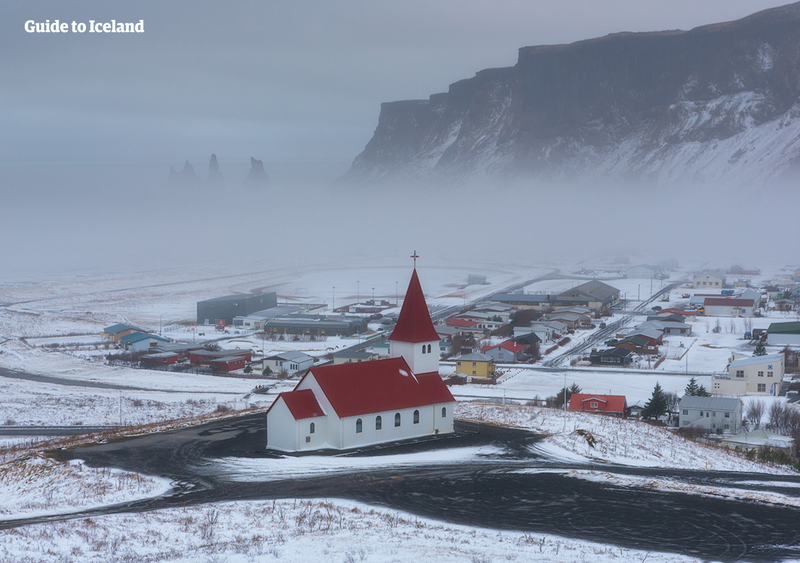 See the best Iceland has to offer with this great value three-day tour. Check availability by choosing a date. Arrival time back to Reykjavík at the end of your tour can vary depending on weather and traffic. It is highly recommended that you do not book your flight home the same night as bad weather or delays could affect your journey. 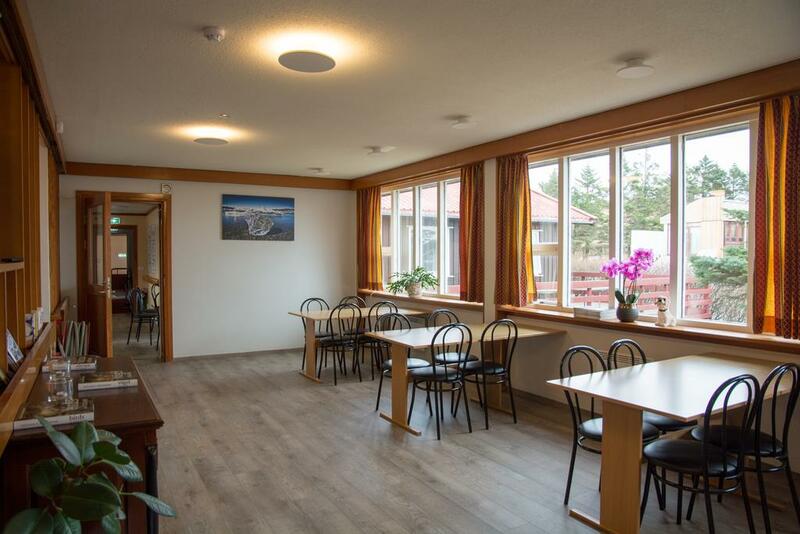 Please be sure to arrange accommodation for this evening and an airport transfer the next day to take you to Keflavík International Airport for your departure. The day begins early in the morning when you are picked up from Reykjavík in a minibus and whisked away to Iceland’s most famous sightseeing trail, the Golden Circle. The first stop is Þingvellir National Park, the birthplace of Iceland’s parliament. It is here where Viking settlers would gather to lay the laws of the land and settle disputes. The park is not only historically significant, but it is also a geological wonder as it sits in a rift valley between two tectonic plates. Next up is the geothermal valley of Geysir where you’ll find bubbling mud pools, boiling hot springs and erupting geysers. 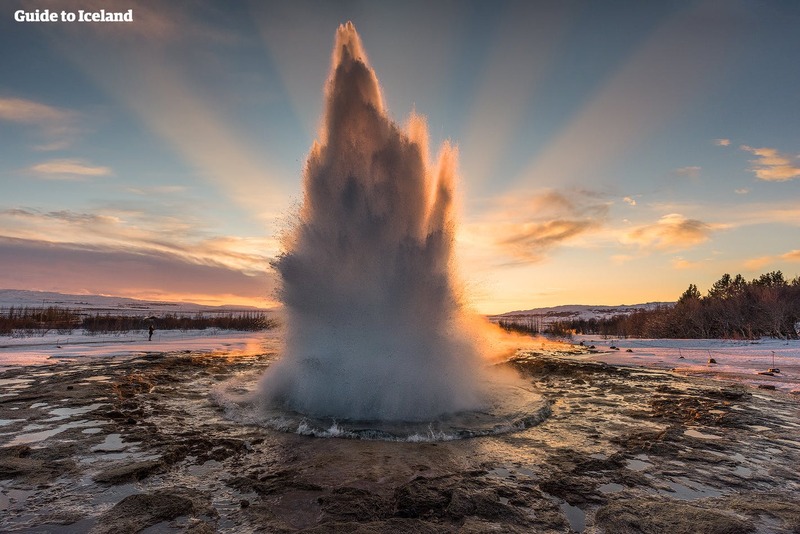 Strokkur is one of those erupting geysers, and this powerful feature goes off every 5-10 minutes, creating a massive water column that reaches about 15-20 metres in the air. 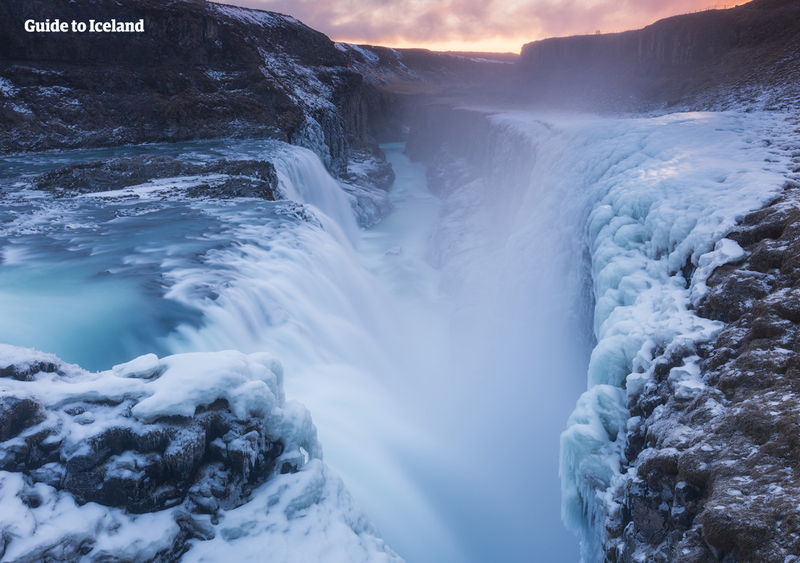 The last stop on the Golden Circle route is the stunning waterfall Gullfoss. Fed by Langjökull glacier, the river Hvítá rushes south before plunging into an ancient canyon, creating this beautiful cascade in the process. The rumbling noise that is produced when the water hits the rocks below is not only mesmerising but also a great reminder of Mother Nature’s awesome power. 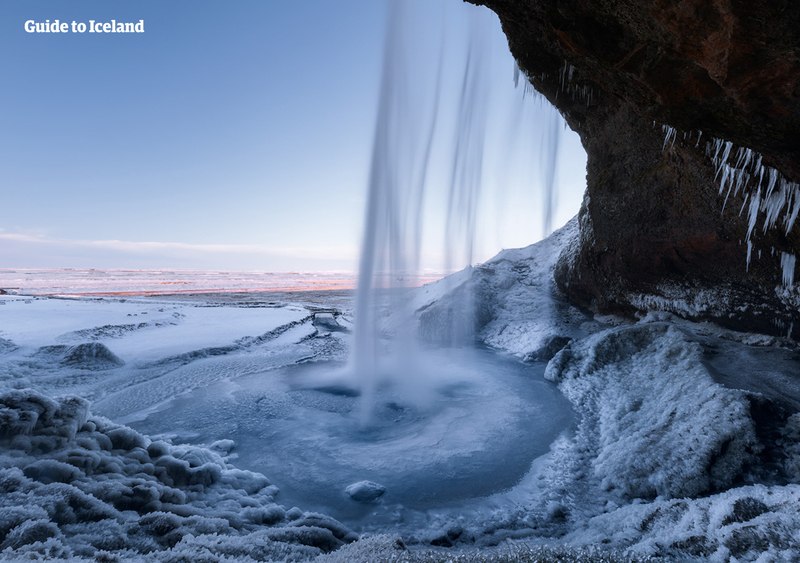 Then it is off to the South Coast where you’ll begin by stopping at another stunning waterfall, Seljalandsfoss. 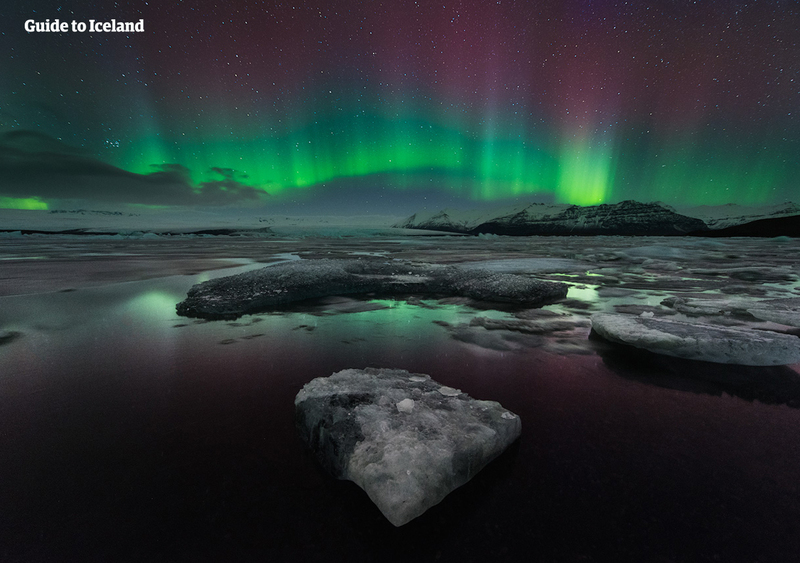 The Icelandic winters are very dark, but you don’t need to worry about not seeing this remarkable feature, it is lit up by two spotlights, providing it with the glamour and grandeur it deserves. In the evening, you’ll be driven to your accommodations on the South Coast which is near the beautiful waterfall Skógafoss. You’ll have the chance to explore this feature further tomorrow so don’t worry if it is too dark outside. However, the darkness does provide opportunities for spotting the Northern Lights. So if the sky is clear, make sure to look up before you go to bed. Now it is time to explore the South Coast fully. 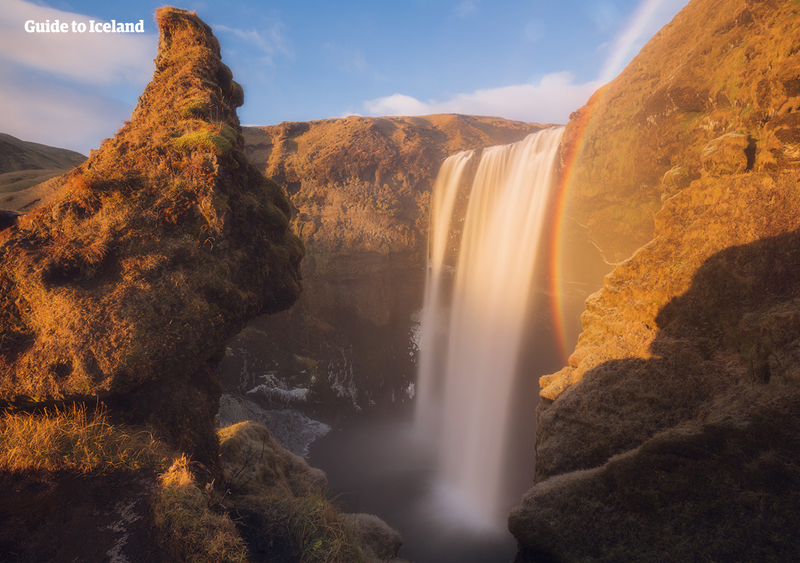 After a hearty breakfast, you’ll start by getting a better look at the waterfall Skógafoss. The land underneath this massive cascade is very flat, allowing you to walk right up to the veil of water. However, you might get drenched if you do so, so make sure you dress in waterproof clothes. Watching over you on your journey today will be two mighty glaciers, Eyjafjallajökull and Mýrdalsjökull. You will have the opportunity to explore the latter with a glacier hike on one of its outlet glaciers. Your guide will equip you with all necessary glacier gear before giving you a short demonstration on how to walk on the ice. Then, there is nothing left but to scale the massive ice cap for some fantastic views over the South Coast. 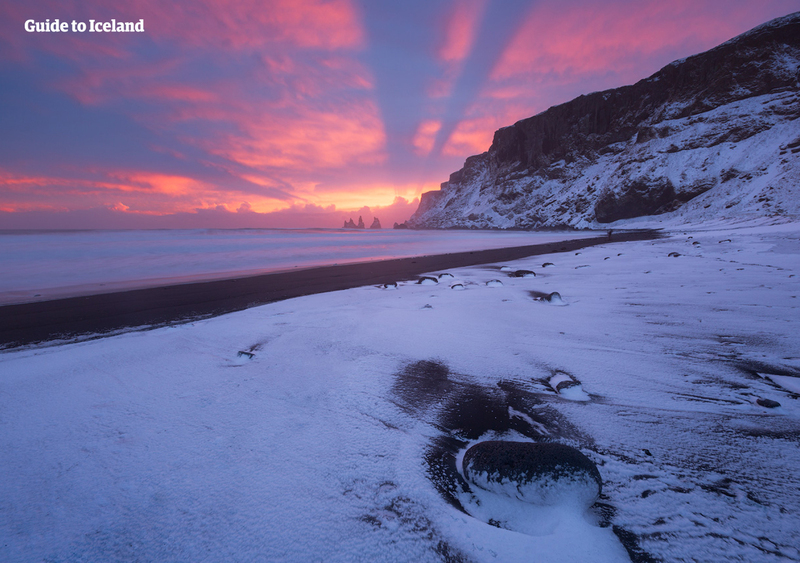 After you’ve descended the glacier, you’ll be transported to the village of Vík which sits on the banks of the beautiful black sand beach of Reynisfjara. Aside from the black sand, the beach is known for its strange hexagonal cliffs and the massive Reynisdrangar sea stack which rise out of the ocean like petrified trolls. Then, you’ll be driven across imposing sand plains and lava fields into the expansive Vatnajökull National Park. 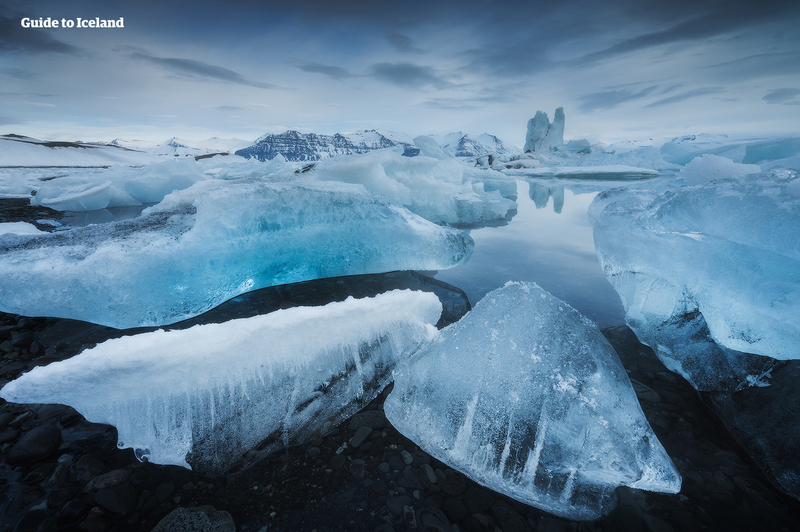 It is here where you’ll find the ‘Crown Jewel of Iceland’, Jökulsárlón glacier lagoon. 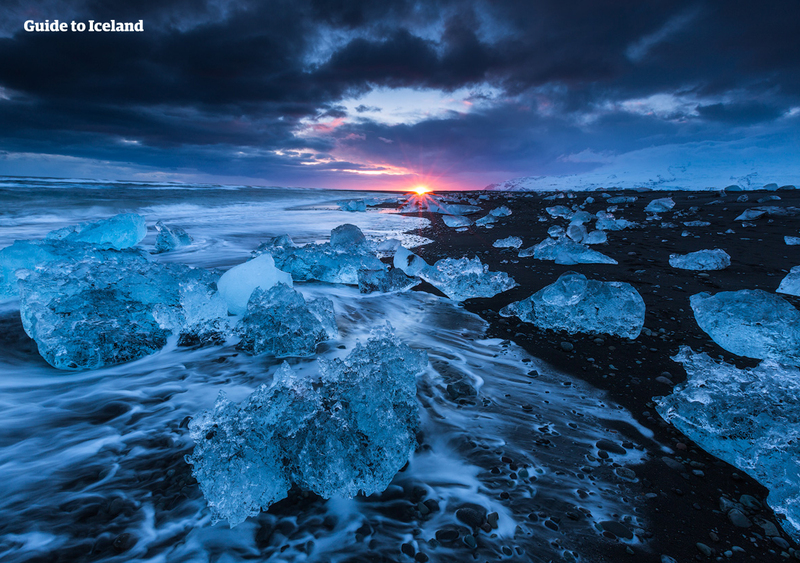 Jökulsárlón is a great, deep lake where massive icebergs, which have broken off a nearby glacier, float on the calm water before drifting off to sea. 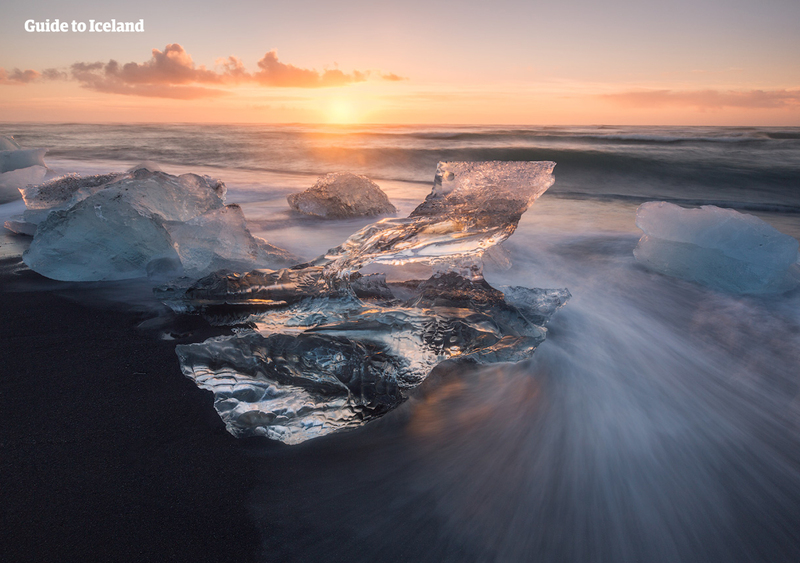 Nearby is the Diamond Beach where ice chunks from the lagoon have washed up on shore and now lie on the black sand, glistening in the low sunlight. You’ll spend the night at a country hostel near the glacier lagoon. 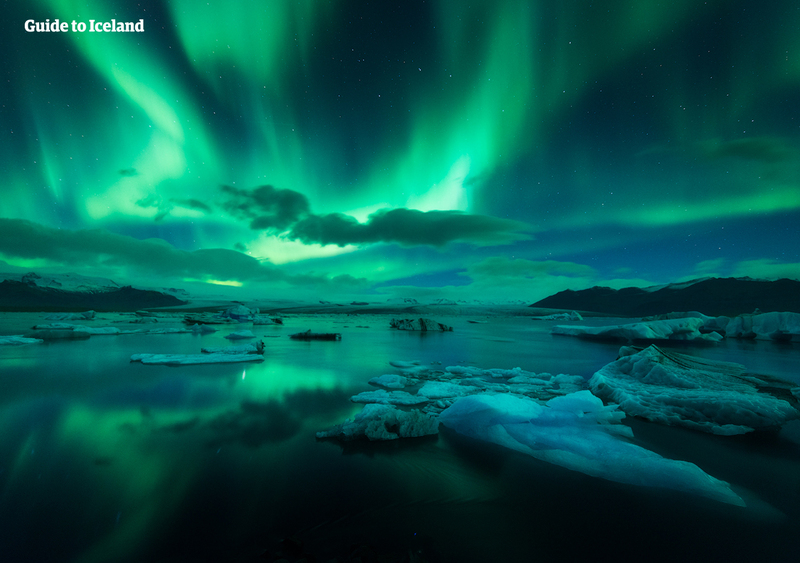 Remember to look up into the sky for a chance to see the elusive Northern Lights. It is hard to top two full days of sightseeing Iceland’s best attractions but day three promises to deliver. 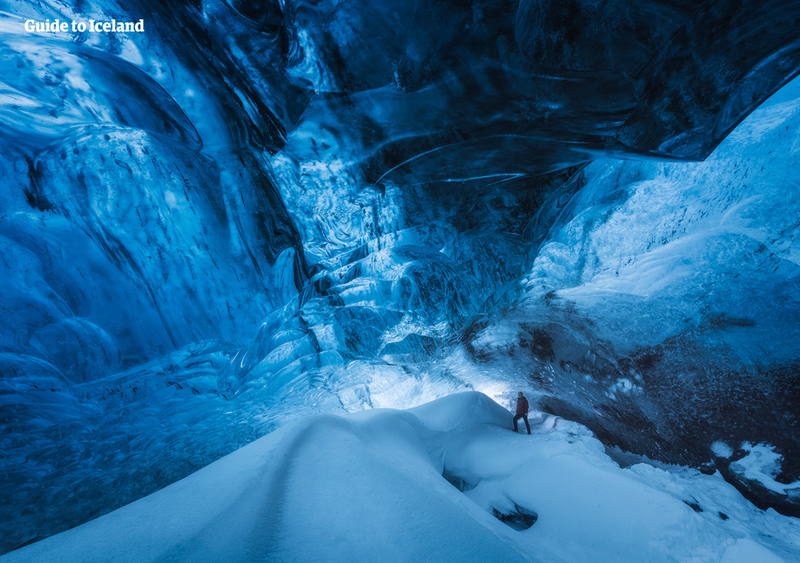 Today, you’ll get to explore a natural ice cave inside a glacier. These incredible features only appear during the winter, and so this experience will surely be a one to remember. You’ll be transported to the glacier in a specially modified super jeep which is capable of handling the rough drive up the ice cap. 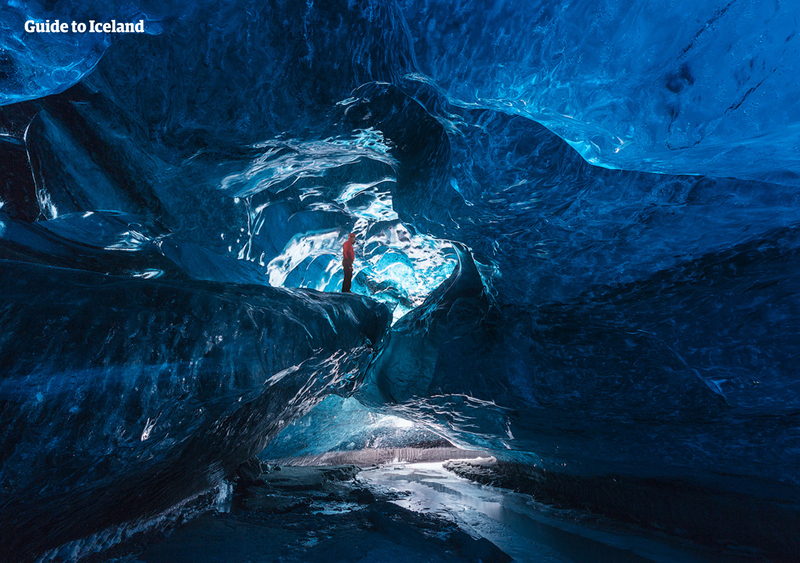 Then, after a short walk, you’ll enter the beautiful blue ice cave. Inside you’ll see a frosty world of bright blue ice walls and strange ice sculptures which form naturally as the glacier melts and freezes again. You’ll be given plenty of time to walk around and explore the cave, and, of course, take plenty of photos. What's a better souvenir than a selfie inside an ice cave on top of a glacier? After a while on the glacier, you’ll head back down in the super jeep to Jökulsárlón glacier lagoon. There, you’ll exchange vehicles, leaving the jeep behind for the minibus. You will then be taken along the beautiful South Coast back to Reykjavík with the guide pointing out to you anything you might have missed the previous days. You can expect to arrive in Reykavík in the early evening but it is highly recommended that you do not plan to fly home right away in case of bad weather or delays. Embrace the world's most northern capital and indulge in Reykjavík’s unique and buzzing nightlife. Below you can see our preferred partners for accommodation. For the first night, they are HI Hostel Skógar or Puffin Hostel in Vík. 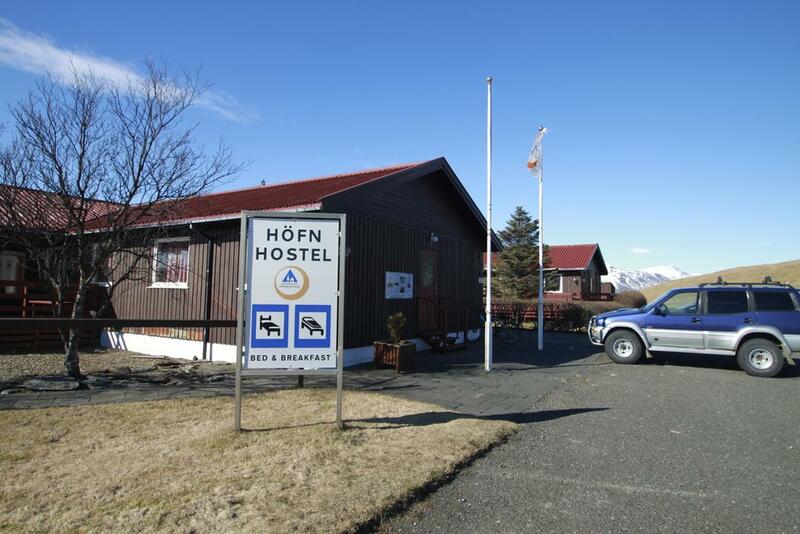 For the second night, they are HI Hostel Höfn or Stafafell Hostel. If not available, an alternative of the same standard will be arranged. 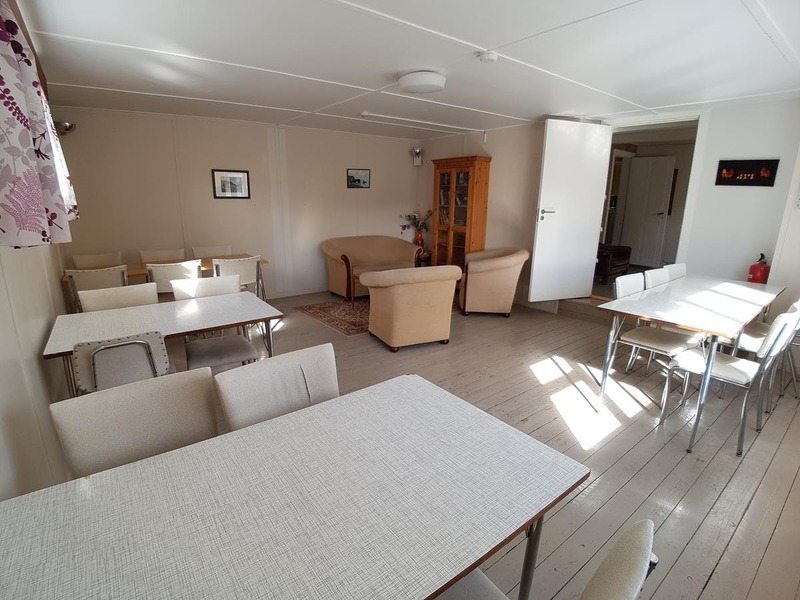 HI Hostel Skógar is located by the spectacular Skógarfoss waterfall in the Skógar villages. 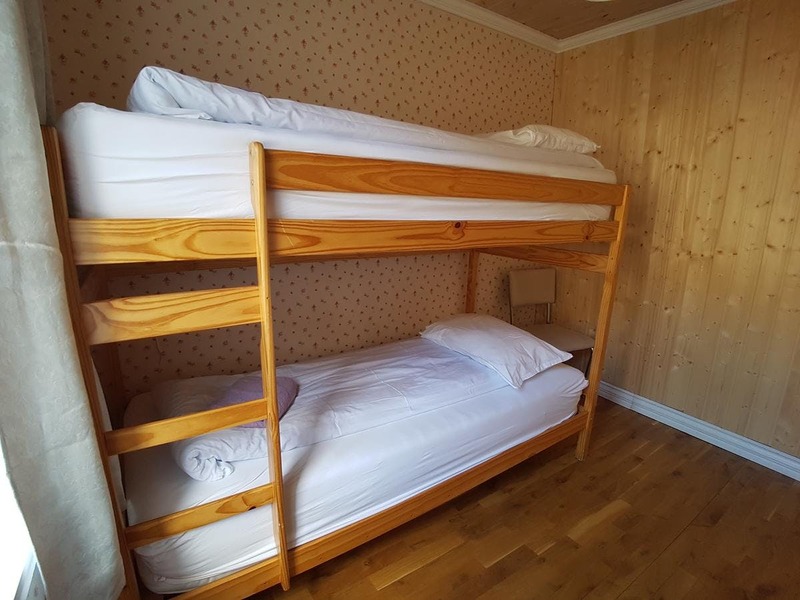 Dormitory rooms with shared facilities. Access to cooking facilities on premises. Free Wi-Fi. Breakfast is included. 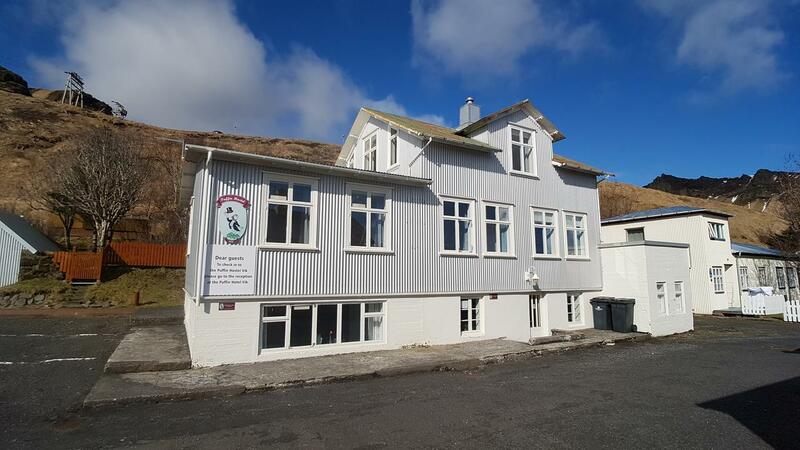 Puffin Hostel is centrally located in Vík. 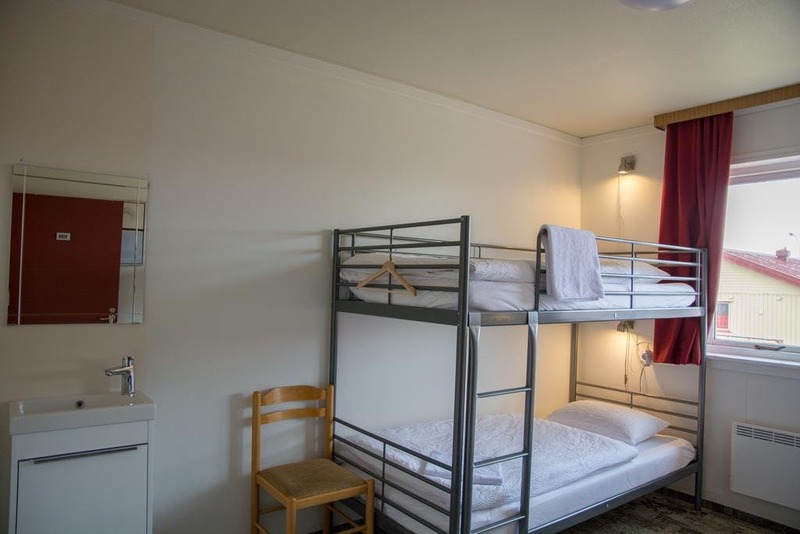 Dorm accommodation with shared bathrooms and a common lounge area. Access to cooking facilities on premises. Free Wi-Fi. Breakfast is included. HI Hostel Höfn is located in Höfn township. 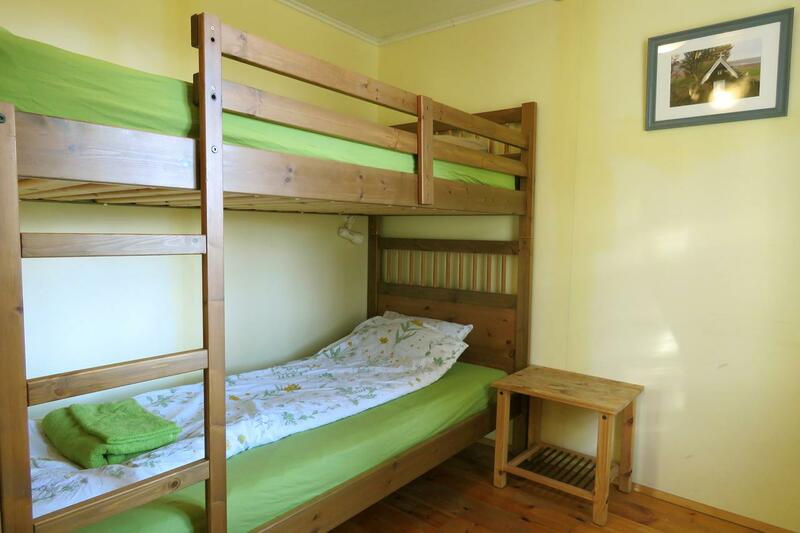 Dormitory rooms with shared facilities. Access to cooking facilities on premises. Free Wi-Fi. Breakfast is included. 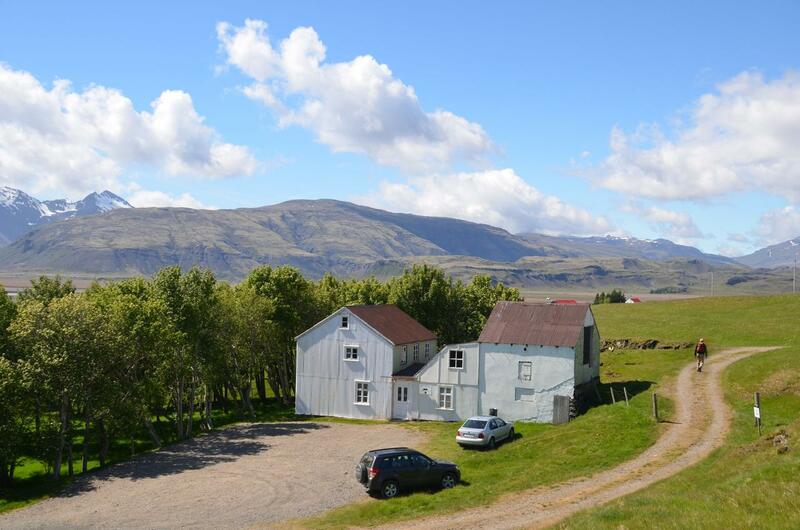 Stafafell Hostel is an old farmhouse outside of Höfn village. Dormitory rooms with shared facilities. Access to cooking facilities on premises. Free Wi-Fi. Breakfast is included. Iceland is definitely a must-see for everyone. I remember balking at the steep price of the tour, but the value you get is very much worth it (I realized this after visiting Norway a little later). The pickup process was quite hectic but once you got going, it was great. The dark-grey Mercedes minibus needed more legroom, but was nice otherwise. Personal highlights for me were Jökulsárlon and the glaciers. Waterfalls were great but got a little stale after the fourth one. The guide, named Christian (I think), was great — cheerful like an old grandpa (though he's not /that/ old), and highly-knowledgeable. I do wish he talked more during the long drives since he has a wealth of personal experiences and anecdotes, but maybe he kept fairly quiet because half of us were asleep at any given time (it was tiring for sure). We got upgraded to individual rooms on the first night, which was a pleasant surprise. 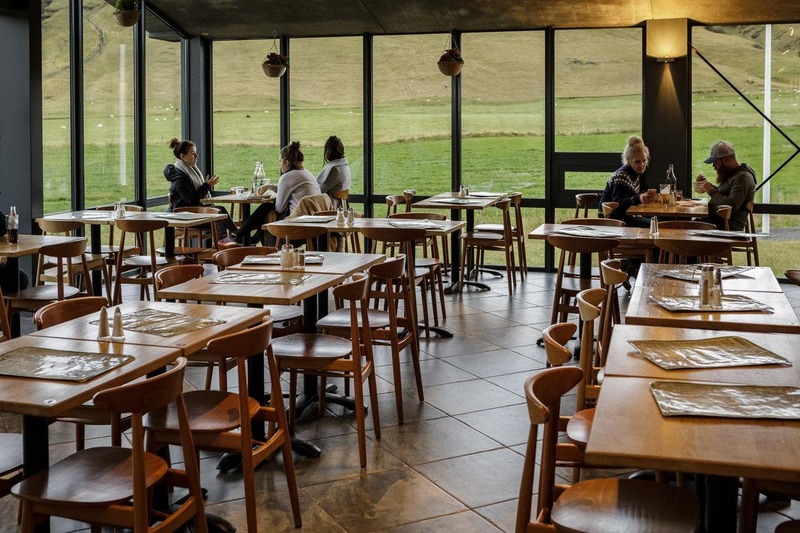 Beware the prices of food in Iceland though — you will have a hard time finding a restaurant meal for less than 20 USD. Also, Iceland is colder than it seems and the wind is utterly arid, so make sure to dress well and bring skin cream if you're prone to this kind of stuff. One regret is that we didn't get to see the Northern Lights; apparently, it's been a hugely-unpredictable season for them. It was a great experience in Iceland. Our guide was really nice and professional. Going with a tour is for sure the best way to travel in Iceland. Book this trip! It is such a great value. We got to do and see so many different things, and it was very convenient and easy to have the driving, tours, and hotels taken care of. Our guide, Hugi, was awesome. He was very friendly and funny. He went above and beyond his job, and he even helped me when my return flight was cancelled. He was also great with my 8 year old daughter. Plus, we got to meet and hang out with a lot of new friends from around the world! Our Guide, Jon is nice and funny when he tell the story about Iceland. The program is well managed even though the weather was changed rapidly but Jon took us to all plae in the program. The hotel at the first night is great and the second hight is hostel but very clean. We have seen Aurora in the second night. Even though I can't see the ice cave that advertise in the tour because unfortunately, it had been meltd last year because of global warming but they took us to other ice cave which is blue even though smaller. I highly recommend this tour. It was one of the excursions I booked during my week in Iceland, and I am really satisfied with it. Our guide "Oli" Olafur, who was always attentive and very kind, was always doing his best to make sure that each visit is going in the best conditions, and was also very attentive. This tour allowed me to see the majority of places that can be visited in the west, south and east of the country. Amazing experience that I highly recommend! We had a lovely time and this trip covers very much all the main touristic areas of the South coast. Good quality/price ratio. Very good driver and guides all along. Fun experiences and wonderful landscapes! My Trip is 10/3 ~ 12/3.My guide is Asdis! She is a nice & experience guy! In these 3 days , she was well planning even 1 of the day is bad weather! She helped us so much & tried her best to explore more about the Iceland. I really hope that I can find her to lead me explore about Iceland in summer time ! Thanks so much! This trip was a great choice. We had truly wonderful time. Everything went smoothly, we saw and did everything and even more than was in the plan. The sceneries were simply amazing. We stayed one night at a hotel ( what was a nice surprise as we were expecting the hostel) and another at a hostel sharing a room with other people. Both accommodations were very comfortable. Breakfasts were very tasty with lots of choices. What made our tour special was our tour guide Ingo. He was very friendly and funny, made a good atmosphere during the whole trip. He was also very knowledgeable so we could learn lots of local stories. A big thank to Ingo for being a wonderful guide and making this time very special! I higly recommend this trip and Ingo as a tour guide! Very good trip! the guide speaks perfect English. humorous, always cheer every member up. you can feel he loves nature a lot and can share many about icelandic nature. Well communication when some unexpected issues happened such as due to bad weather we need to change the schedule. The guide can handle dangerous situation well and secure everyone's safety. I learn many from him to know local culture, dramatic weather and dramatic life too. Small group also makes everyone know each other more. we had 11 members and all from various countries. all ppl are flexible to unexpected issues, no one complains which makes team atmosphere is awesome. 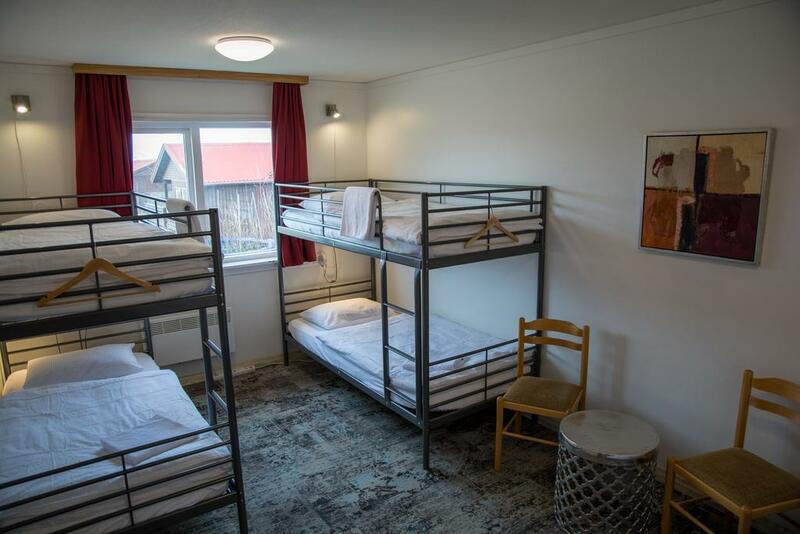 the first night we stayed in hostel skogar and 2nd night in hotel Klaustur. Both are good and clean. The car we used for 3 days is also new and good. Excellent tour! Perfect for a first-time budget traveler who doesn't want to rent a car in the middle of winter. The Aurora Hunters team answered my pre-trip questions quickly. The pickup process was smooth. My tour guide/driver was informative and made unique stops outside of the itinerary. We were able to see and capture the northern lights at Skogarfoss! I felt comfortable as a solo traveler and met some interesting and friendly members in my tour group. Both the glacier hiking and ice caving were really exciting for a first timer. Highly recommend this tour! It was a wonderful tour and I felt very lucky to have joined it. Everything went smoothly, we saw&did everything as in the itinerary and the sceneries were trully amazing. The only thing we missed was northern lights but it's a natural phenomena. We stayed one nigth at a hotel and another at a hostel sharing a room with two other people. I was worried about sharing a room but both accommosations were very clean and comfortable. Breakfasts were very good. I think what made our tour even more special was our tour guide Ingo. He was so friendly and funny, made a good vive during the whole trip. He was also very knowledgeable so we could learn lots of local stuff which we would have missed without him. A big thank you to Ingo for being a wonderful guide and memory creator! I recently returned from a fabulous week in Iceland. While the weather did not cooperate for some of the featured tours or Northern Lights, it was still a wonderful trip. There landscape did not disappoint, and the accommodations were clean and lovely. I would say that as in any tour, the tour guide makes or breaks the tour. The small size of the tour was perfect, and it was nice to have an option to get out of town and see more of the land. Upon returning home, both Guide to Iceland and Aurora Hunters addressed a concern very quickly and professionally -were very responsive. The tour is perfect if you want to see a lot of things for a short time and on a budget. Still we have enough time for almost every atraction. The hostels were very good and clean with amazing rich breakfast . Our guide, (unfortunately i dont remember the name :( (the trip between 26-28 feb 2019) was absolutely amazing. He has a good humor and made the travel great. We have the chance to see the Northern lights even! Thank you AuroraHunters! It was an wonderful experience to travel with Guide to Iceland. My friend and I was really statisfied with this trip. We went to the most popular sights and experienced the exciting glacier hiking. The accommodation arranged during our stay were also clean and nice! Our guide Sjonni(not sure whether I spelled it right or not), he is really a funny and cool guy. He is responsible and patient as well. We enjoyed this trip very much and luckily we even saw northern lights outside one of the hotel we stayed by accident ! It’s was amazing! I would definitely recommend this tour to my friends. I traveled with my teenager son and we have a wonderful time. For a first timer in Iceland it was a perfect trip to see the most known sights. the driver was very knowledgeable and safe driver. The accommodations were good, clean and comfortable, even as hostel we got a private room for 2. I already recommended this tour to many people and I can't wait to go back. Trip period: Feb 2-4. Wonderfully and meticulously arranged. A warm and understanding guide (an extremely safe driver too!). Even though daylight in early February lasts about 7 hours, time for all sightseeing points is adequately allowed. A massively enjoyable and satisfying experience! Itching to join a similar trip again! The tour was very smoothly-run and the sights were exceptional. There were strong winds during our trip, so the guide helped us rearrange the schedule. We missed the Glacier Lagoon, but the guide made up for it by showing other wonderful sites. We saw Northern Lights on two nights, which was the highlight of our trip. The guides on the glacier and in the ice cave were also super friendly and considerate. The hostels we stayed in were also comfortable and clean. Overall, it is definitely worth the money! Our guide is super friendly, humorous and considerate, and he drives safely. There was a snow storm coming during our trip, so the guide helped us rearrange the schedule and the hostel site. In the end, we didn't miss anything. We went to almost all the sites listed in the schedule, and we even saw Northern lights thanks to the change of our hostel. Our guide/driver had to drive for an extra three hours in order to help us get to the safe place away from the storm, and he didn't complain at all. He was so nice!!! Nothing to complain about the trip arrangement. All the important sites in the Southern part of Iceland are included. Though the accommodation is not luxurious but staying in the countryside raises the chance of seeing Northern lights. nice experience. knowledgeable guide, grant nature, clean accommodation. I would recommend this tour! Although we were to wake up earlier than others, we kinda enjoyed the benefit of being the first group who went to those places. The guide was nice and kind and we might come again! I would definitely recommend this tour to anyone travelling to Iceland! We had a very friendly and knowledgeable guide, who was able to provide plenty of information on Icelandic nature, culture, society, or anything else that we were wondering about. Though the roads were icy and there was a strong wind in many places, I always felt very safe as he was also a very capable driver. I honestly think that this is a much safer way to explore the South coast than renting your own private car, as our guide was experienced in driving under difficult conditions (plus, you will learn a lot more!). The guides on the glacier and in the ice cave were also extremely informative, so I wound up learning a lot during this tour. 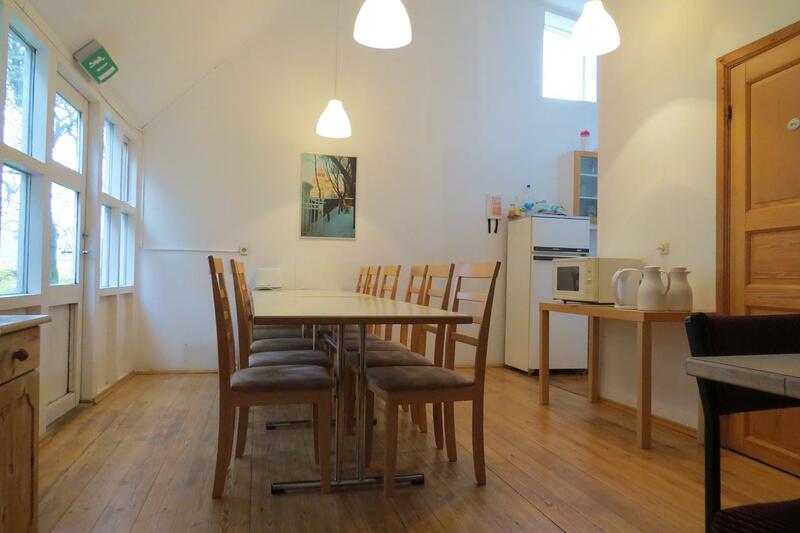 The hostels we stayed at were clean and cosy. All in all, the tour was very smoothly-run, incredibly informative, and the sights are absolutely breathtaking. It is definitely more than worth the money, and I would consider it a must-do! Fantastic experience! Accommodation was ace, and our guide Loftur was so helpful and knowledgeable, he told us so many interesting stories about Iceland, it made the whole experience of this unbelievable country even better! 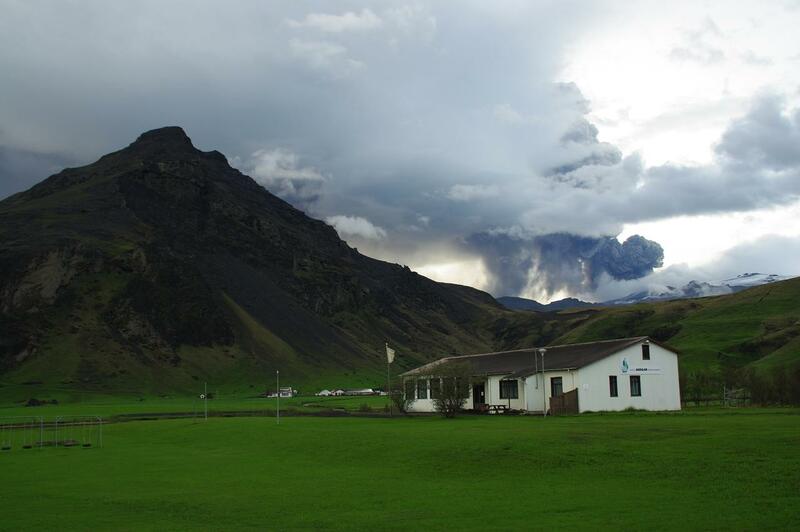 I even learned how to pronounce Ejafjallajökull! Great tour with reasonable price. Fantastic tour! I was really nervous travelling by myself for the first time, but the tour was incredible. The company was very organised and punctual and kept us informed of any potential changes. It was a smoothly run trip with friendly guides and unique sights. It is good. The girl guide is very nice and have taste for song selection for such a long drive. We have seen the Northern light just after our hostel. Can have breakfast at Hotel. The wifi is on the bus. But the blue ice cave is really small. Hope to see the bigger ones. Amazing experience and very friendly guide. Got to see most of the sights apart from when a storm halted our travel for the day, however we made up for it the next day and even saw the aurora + took an awesome group pic with the aurora in the background. Overall would recommend to anyone looking for a tour that is mildly paced. It’s a very nice and impressive tour experience !! This tour took us to all the places we wanted to see. Highlights were glacier hike, diamond beach and the ice caves. The guide we had for the ice caves was exceptional and informative. Our driver for the three days was a good driver, but not a good guide. It was hard to understand his English and we were told very little about the attractions and Iceland in general. This was disappointing. I expected much more from the driver than just to drive and tell us what time we had to be back at the bus. The tinted windows of the bus made it hard to see outside during the short winter days and the seat belts didn’t work very well. The small group size was a bonus. Good service and really appreciate the team's cooperation. Really nice experience, I enjoyed everything ! And we saw Aurora in Hofn. It was so so so amazing. Recommending this to everyone! Enjoy it ! Although I missed most of the first day due to crazy weather at KEF airport, I had a great time because of my amazing tour group and guide, Orri! We got to see a lot and the ice cave activity was definitely the highlight of my trip! Eating is pricey in Iceland so beware. Aside from that note, I highly recommend this trip because you get to see all the highlights of Iceland in the span of three days. This tour group was beyond my expectation. Thanks for the driver Sjonni (hope my spell is right) being so nice and kind to everyone. And we saw the aurora near Hvolsvöllur on the first night, which made this tour really worthwhile. What's more, the song we heard every day in the bus just brainwashed us, 'it's the island call~it's the island call~'. Great tour for the price. We weren't able to see the northern lights due to the cloudy weather but overall, I had an amazing time. Highly recommend for those wanting to travel the South Coast on a budget. Tip for budget travelers: Purchase your own groceries prior to embarking on this tour. You'll save about 75% of your food budget because each meal (lunch + dinner) costs a minimum of 1500-2000 ISK. The trip itself was really good. The experiences were great, esp for the glacier hiking part - which was not as hard as i had expected and i hope it can last even longer. But I couldn't see aurora during the tour - which is sad but not the problem of the tour. Just be prepared for the fast-changing weather and long transit time. If you want to learn about Iceland's history/culture/people etc. DO NOT TAKE THIS TOUR. Our guide (Juan) barely told us anything about the places we visited and sometimes the information he gave us was wrong. In total, I think he spoke about a hundred words to us over the three days. I take tours so I can learn about the country that I'm visiting. If I knew this was just going to be a chaufered trip around Iceland, I would have just driven myself. This tour is given by a company called "Aurora Hunters" but there was zero aurora hunting on this tour even when conditions were good. Juan would just say "It doesn't look promising." Or "The mountains will be in the way." And that was it. We had one clear night where the lights would have been visible but we had to go out ourselves to see the because Juan didn't want to put the effort in. We easily could have had a better view of them if we had been driven just a little outside of town. Juan drove right past some signs without a single word as to what they were. He never came out with us to any of the stops to explain what we were seeing which is a shame because some places don't have any educational boards. All that being said, the sights that you get to see are great and the little tours bundled into this like the glacier hike and ice cave were incredible and done very well. Apparently when they say this tour is 'on a budget' they mean they take out all the worthwhile stuff like the culture and history and just give you a chauffer to photo stops. The morning of departure we got to the lobby of our hotel, Fosshotel Reykjavik, at 7:45am to check out of the hotel. We proceeded to wait along with many other travelers whom were all waiting for their own tour buses. Every tour bus that came along, we all would rush out into the rain and wind to see if it was our bus. Some travelers found the right bus, the rest would head back to the lobby to continue waiting. As time passed by, different tour buses would come and go including Reykjavik Excursions, snaeland tours, arctic adventures, Icelandic horse rides, greyline bus, and others, I would rush out everytime to check if it was for me. Some other tour guides/drivers were not even familiar with Aurora Hunters. Uh oh, I suspected we got scammed by a fake tour company. Around 8:40am I tried to get some help with the tour desk at the hotel. They we're unable to reach my tour by phone so I continued to wait. I asked one of the tour guides who picked up the last remaining travellers if they can reach my tour guide. The guide conforted me that all tour buses should arrive as it was a busy morning with lots of travelers and many hotels to pick up from. "You are not forgotten" the guide said "you're probably just the last ones to go". So I waited a bit longer. Around 9am to 9:30am, I tried to call the emergency number on the voucher numerous times, but the line was dead. I searched the internet for the number to the headquarters of Aurora Hunters, but the line was not working. I found a couple other numbers online for this company/owner, none of them worked. I sent out emails to different email addresses belonging to this company. By now I was sure I got scammed, thinking would have to fight the charges later with my credit card. 9:30am I asked the tour desk from the hotel to help again. She was able to contact the tour company via Facebook, got a number to call and she was told they know nothing of this, they don't care, it is not their problem and hung up. 10am all other travelers we're gone, tour buses stopped coming. I resigned to my unfortunate fate and had to figure what I was going to do and stay for the next 3 days. Luckily, I was able to rebook my room at Fosshotel Reykjavik, albeit higher than my original advanced booking price. As I was heading to my room the tour desk person handed me a number and name of a person, named Omar, who was awaiting my call. I called that number and it was not working. At this point, I wasn't surprised. Then I got an email from Aurora Hunters replying to one of my early emails asking me to call them. With the number they gave me I was able to get through, however the person I spoke to said it's the wrong number to call. They are phone operators and could not assist the situation. 10:30am, as I was settling into my room again and trying to figure out what to do next from this entire ordeal , I got a knock on the door. It was the tour desk person. She said the tour manager is downstairs waiting to talk to me. I went downstairs and was greeted by the tour manager and another driver. According manager, our reservation got canceled due to a mix-up with other last minute cancellations. The manager blamed the tour desk for not notifying the tour company of us, which is unfortunate because that was not the case at all, she was helping us all morning trying to reach the tour company. The hotel was nice enough to cancel the most recent booking although it was considered non-refundable. I will need to monitor my credit card to confirm it was indeed refunded. In the end apologies were issued all around and the other driver drove us to catch up to the tour group which we reached around 1pm. The first 2 stops we rushed (only 15 minutes both stops) in order to catch up with the tour group. Once with the tour group, the rest of the tour went on smoothly. Our tour guide was very knowledgeable and the tour was fun. But to be honest, next time I would probably stick with a bigger and better known tour company like Reykjavik Excursions, which had multiple tour bus come pick up lots of travelers that morning. Highly recommended. Good organization and great tour guide. I think everyone will be joyful in this 14-person team. The glacier hiking is wonderful and black beach and many foss, I love those but not the Ice cave which we expect too much comes a little disappointing! However, the whole trip is great !